Former minister: We cannot accept an Arab state in Judea and Samaria. We have to act like the landlords in the Land of Israel. 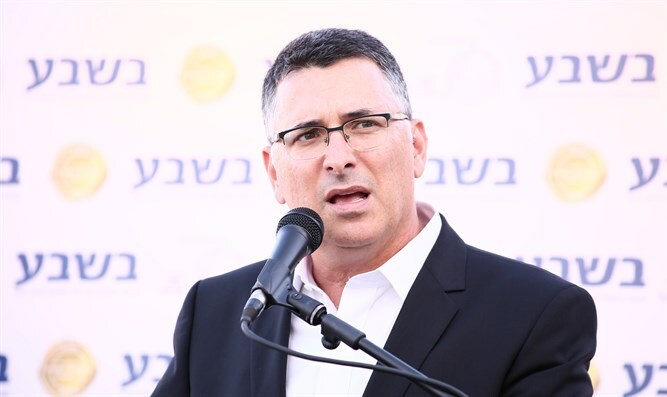 Former minister and Likud member Gideon Sa'ar participated on Thursday in the My Israel conference in Jerusalem, and presented a far more right-wing agenda than that of Prime Minister Binyamin Netanyahu. "The settlement enterprise in Judea and Samaria is forever," Sa’ar said, expressing support for the application of Israeli sovereignty over the region. "We need to make a move that will bring about normalization and say that we're there forever. We must apply sovereignty in the Israeli settlement areas and we must build everywhere in the Land of Israel." He criticized the quiet construction freeze which has been ongoing in Judea and Samaria, saying, "Where there is Jewish life, it does not need to be frozen, it does not harm the chances of peace, it does not harm anything. We have to behave like the landlords in the Land of Israel." Sa’ar discussed the Trump administration’s peace plan, which has not yet been made public but which will reportedly be unveiled soon. "I do not know what came up in the talks between the President of the United States and the Prime Minister of Israel, there is a strong friendship between them also on the personal level. I am convinced that we do not know everything or even most of what is going on," Sa'ar said. “I want to believe that in these talks Netanyahu, who is both experienced and talented, is trying to pave new paths than those that existed in previous administrations and which were based on the idea that the solution to the conflict involves an Arab state in Judea and Samaria." Sa'ar stressed his opposition to the establishment of a Palestinian state. "We cannot accept an Arab state in Judea and Samaria, regardless of who demands it." Regarding Jewish Home chairman Naftali Bennett's threat to topple the government if a plan is put forward recognizing a Palestinian state, Sa’ar said, "Obviously we will oppose such a plan with all our might, and we will be happy if smaller parties also add their opposition."